But it did - I got caught. 'Caught smuggling half a million euros' worth of cocaine, Paul Keany was sexually assaulted by Venezuelan anti-drugs officers before being sentenced to eight years in the notorious Los Teques prison outside Caracas. `It won't happen to me. That's what I thought when I got on the plane to Venezuela. But it did - I got caught.' Caught smuggling half a million euros' worth of cocaine, Paul Keany was sexually assaulted by Venezuelan anti-drugs officers before being sentenced to eight years in the notorious Los Teques prison outside Caracas. There he was plunged into a nightmarish world of coke-fuelled killings, gun battles, stabbings, extortion and forced hunger strikes until finally, just over two years into his sentence, he gained early parole and embarked on a daring escape from South America . 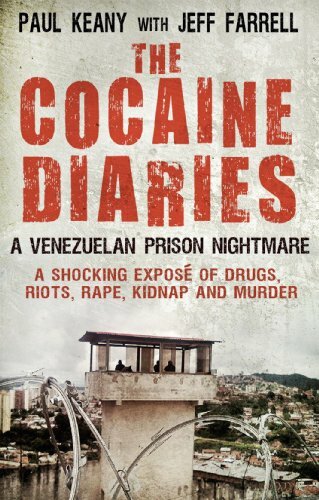 . . Aided by his extensive prison diaries, Keany reveals the true horror of life inside Los Teques: a shocking underworld behind bars where inmates pay protection money to stay alive, prostitutes do the rounds and vast amounts of cocaine are smuggled in for cell-block bosses to sell on to prisoners for huge profits. The Cocaine Diaries is a remarkable story, told by Keany with honesty, courage and even humour, despite knowing that every day behind bars might have been his last.